The first rule of writing is to focus on matters you've lived through, and understand, which aptly embodies the keep-it-simple-stupid (KISS) principle. KISS is a long held design rule that states most things generally perform best when they have simple designs rather than over thinking it. It is not meant to imply stupidity, on the contrary. "Everything should be made as simple as possible, but not simpler." Believed Albert Einstein, by which he meant simplify the design of a product and success is achieved when a design is at its maximum simplicity. So, Roland Sands uncomplicated response to why he chose a 2006 Harley Davidson Softail for his latest project fits that logic perfectly. "We had one and it made sense," he remarked. "It was a pretty simple project actually. I had a bike in the shop that was a custom we wanted to change. 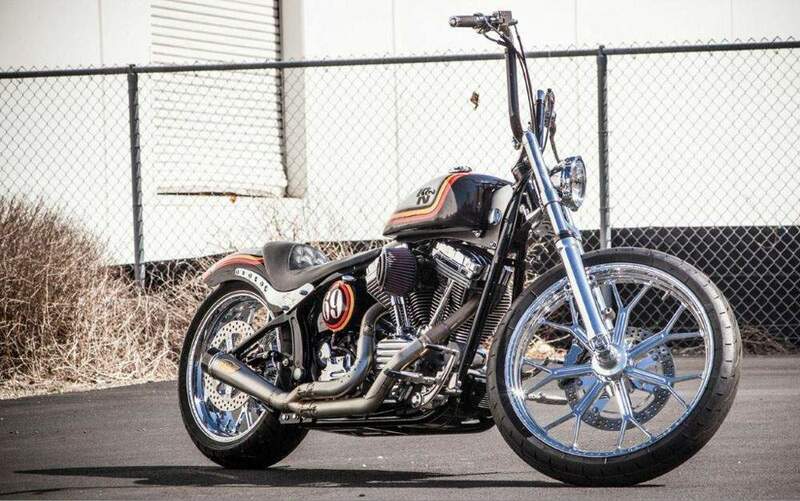 So we based the bike off the original Softail and added some new tweaks. Obviously the paint job is very K&N, so that was my initial inspiration, as well as some vintage racing flavor. I love the K&N logo and colors, so those three were easy to apply." 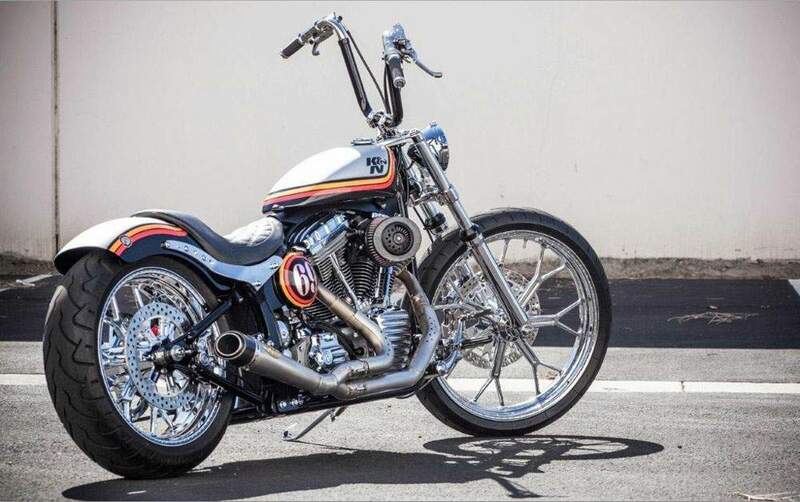 The Roland Sands K&N Custom Harley Davidson Softail was on display at the 2013 SEMA Show. The Long Beach, California native is an award winning designer for Performance Machine, and he is the owner/founder of Roland Sands Design. Sands was the 1998 AMA 250GP National Road Racing Champion, and he has a lifetime of motorcycling experience from which he draws his design insights. He intrinsically understands the subtle nuances of the motorcycle culture, the clear distinction between cool and kitsch, which he applies to his creations. 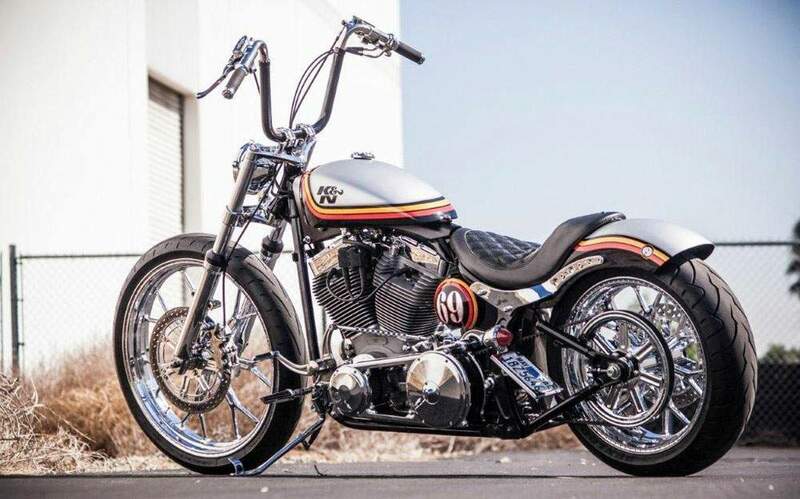 Since opening RSD in 2005 Sands has distinguished himself as a leader in the design of functional, aggressive, well-rounded, and aesthetically pleasing motorcycle hard parts, accessories, and riding gear. His ultimate custom motorcycle designs have been described as balance of sport bike and chopper influences. "Every rendering is different," Sands says about his process and his frequently evolving design sketches. "Sometimes it's basically just to get the paint nailed. Other times we really try to build it exact. This bike may have had a vintage seat on it originally, but we decided to go with our Boss solo, as we haven't used one on a bike, and we had one in the shop. It was last minute." The head-turning Softail features an exclusive custom designed Slant Carbon Fiber Air Cleaner with a K&N Air Filter. "This idea came from an existing K&N air filter that we morphed into Carbon fiber to match our Slant Exhaust tip," Sands explains. "It was really a new way to look at an exhaust and intake package. The cool thing about the air cleaner is it allows for more knee clearance, which is really nice on a Harley." How was the bike received at SEMA? "People want to ride it," Sands reports. "That's a good thing." "I have a few KTM's were finishing up and a Dyna Glide just went on the table today," he adds about his ongoing project list. "Things are getting chopped up a bit as usual." Front Wheel: RSD - Del Mar 23x3.5"
Front Disc: RSD - Del Mar 13"
Rear Wheel: RSD - Del Mar 18x5.5"
Rear Disc: RSD - Del Mar 11.5"
Handlebars: RSD – ProStep 12"